Visitors' guide - Step 3 Contact the producers! "Making champagne is labour-intensive. 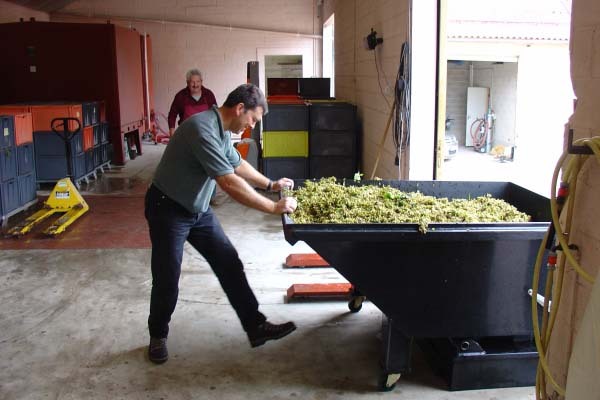 The whole year through the producer labours on the field or in his cellar. Make sure you visit him at a convenient moment, so it's best to make an appointment. Surely you want the producer to make some time for you." Contact the producers you want to visit beforehand! ‘Visitez nos caves’ or ‘Venez déguster nos champagnes’. These slogans are designed to draw passers-by into their cellar; it doesn't always mean the winegrower has lots of time to spare. Contact the different winegrowers some weeks before your visit, let them know how many people he can expect and agree on a time. It's interesting to know which cuvées you can taste, if it’s possible to visit the cellars, the press. When you have made appointments with the producers, it’s a good idea to nominate someone as the timekeeper during your visit. After a couple of glasses you might have so much fun that you lose track of time. If you intend to visit a large champagne house, check their website first. Send them a mail or call them in order to get some practical information: opening hours, duration of the tour, price, language of the guided tour. And last but not least: make sure that your last visit is closest to your accomodation. That way your driver also gets the opportunity to sip a glass of champagne.